In 2011 Paolo Cominoli joined his nonna Vittoria Binotti at their tiny 5ha family estate, whose roots lie deep in the soft, acidic, Monte Rosa morainic, clay & alluvial soils of the small, historic 14ha Sizzano DOC in the Alto Piemonte region. Sizzano was the second region to be awarded DOC in 1969 after Gattinara. The Comero vineyards comprise Vespolina (a relation of Nebbiolo), Nebbiolo & Erbaluce. They lie at c. 200metres ASL, along the banks of the river Sesia valley & above the village of Sizzano; they were planted largely in 2000. In 2013 they also started working with three plots of Erbaluce, one of which was planted – maggiorina trellised – in the 1960s. The Sizzano DOC wine stipulates a min. 50% Nebbiolo (Spanna) & maximum of 50% of Vespolina &/or Uva Rara (Bonarda Novarese); plus 10% of red, non-aromatic, Piemontese fruit may be sourced. Ageing of SizzanoDOC is min 22mths, of which 16mths should be in wood. Paolo’s Sizzano DOC wine is made up of 65/70% Nebbiolo & 30/35% Vespolina, vinified for between 15 – 20 days on the skins, followed by up to 24 mths in 10HL botti grandi. Total acidity tends to be at 6grams/litro; pH at 3.50; alcohol 13.5%; production c.1300 bts (vintage 2015). 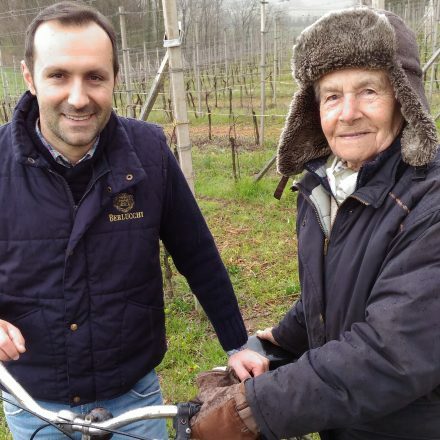 When not tending his vines, Paolo works at the Berlucchi estate of Franciacorta, in both the vineyards & cantina. 2018 Colline Novaresi Bianco (Erbaluce) – this is the first year that Paolo has vinified his Erbaluce only from 100% own estate fruit, enough for 1300 bts! The result is impressive: more together/composed than previous vintage, a lovely roll of gentle citrus fruit, notably agrumato, buono! 2017 Vespolina Colline Novaresi – tasted from stainless-steel in April’18, 13%, wow! this Vespolina shows great lift, raspberry rose, delicate, fragrance, white pepper notes remind one of its Pelaverga & Nebbiolo cousins. Fine & juicy. Vespolina has a tendency to dry on the vine during August, so earlier harvest & care must be taken when macerating (short) or risk dry stalky tannins. 2017 Nebbiolo Colline Novaresi – tasted from tank in April’18, 13.5%, Nebbiolo vintage dogged by frost (19 April), hail twice & then rain at harvest, hitting Nebbiolo hardest. Late, end October harvest. The prettiest red rose, lampone ice cream aromas, very pure, racy, lovely fragrance, refined & linear. 2017 Sizzano – tasted Oct’18, 13.5% the Nebbiolo part was macerated for 5 wks, 10HL French oak botte bought in 2013, exultant fruit, raspberry ripple ice cream (! ), pretty, crunchy, gioioso/joyful! 2016 Sizzano – tasted Oct’18, from 10HL slavonian oak botte bought in 2012, composed chinato-esque nose, preppy raspberry fruit, good energy & pace; the white pepper Vespolina share adding tonality to the wine/lift…to be bottled May’19. 2015 Sizzano – tasted April & Nov’18, 13.5%, a perfect vintage in Alto Piemonte, with two rain showers during the summer, 3 wks maceration for the Nebbiolo part, followed by 24 mths in botte (French & slavonian): fine, delicate, rose & marzipan aromas, bright & esile/slender, very much an Alto Piemonte wine on account of its lower alcohol, lower pH (higher minerality) & fresh acidity (close to the Alps). Yet gentle, suave, cleansing cologne freshness, with classic, telltale Nebbiolo (& Vespolina, a cousin) structure & lines, if more muted. Fine, porcelain tannins. French oak botte lends a ripe mandarin creamy tone. Lovely bright, elegant example of one of Alto Piemonte’s smallest, & finest!, DOCs. Only 1300 bts made.